There are several kinds of Eye Injuries, such as: a Black Eye, a Foreign Object caught in the eye and a Chemical Splash in the eye. 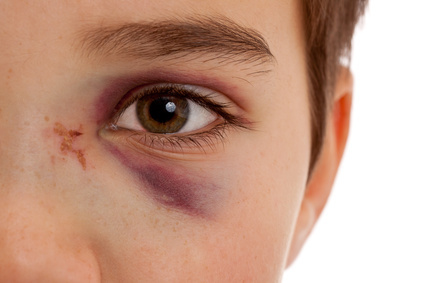 Black Eye: is caused by broken blood vessels (or, bleeding beneath the skin) around the eye. 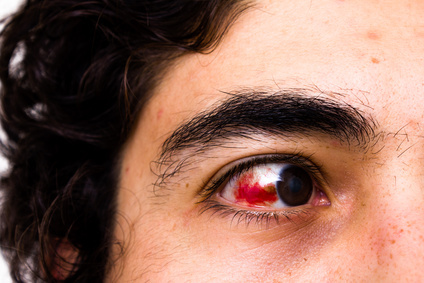 Sometimes, there can be bleeding inside the eye which is called, Hyphema—blood in the front chamber of the eye or in the cornea. Treatment: make sure to apply a cold pack or ice pack to reduce the swelling of the patient's injured eye. If blood is visible, in the eye, seek medical attention at the nearest hospital. If the patient has any vision problems and/or any blood leakage from the eye seek medical attention immediately. Foreign Objects: in the eye can be very serious and proper aid is necessary. Treatment: make sure your hands are clean. Make sure to pull the lower lid down while having the patient look up and vice versa in the opposite direction. Clean the patient's eye with saline solution or water. Make sure to call 911 or take the patient to the nearest hospital if: the object is in-removable, if it’s embedded in the eyeball, if there 's any abnormalities or persistent pain once the object is removed. Chemical Splash: can cause extreme pain, mild pain and no pain. Treatment: make sure to have the patient run his/her eyes under lukewarm water for at least 20 minutes. Make sure contact lenses are removed. If the patient undergoes persistent pain make sure to call 911 or bring the patient to the nearest hospital. Make sure to have the patient take the bottle or the name of the chemical to the hospital (for medical determinations). Evaluate the patient who suffered a head injury by checking for concussion symptoms and change in consciousness. This check should occur as soon as possible. 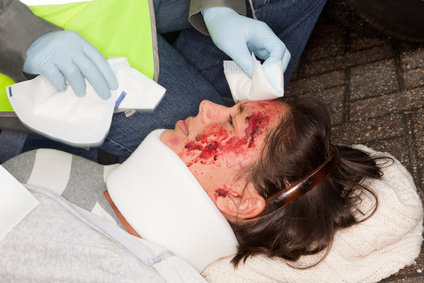 Head Injuries usually result in minor bruises or bumps, however, some head injuries can be very serious and even fatal. If these signs appear call 911 immediately: If the victim has a seizure, slurs while speaking, if the patient’s pupils are unequal in size, any inabilities in the usage of body parts or motor skills, any loss of balance (make sure to tell the patient to sit down), confusion, any discoloration in the face, a severe headache or if there’s any severe bleeding from the head, nose, ears or face call 911 immediately. Do Not attempt to remove any articles off of the patient and unless necessary, do not move the patient. Cover the wound if blood is immense; however, do not apply any pressure for any head injuries (lightly cover the wound). 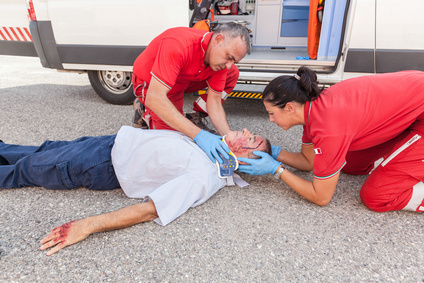 If the patient falls unconscious or is non-responsive without a pulse make sure to call 911 and perform CPR. Spinal Injuries are very serious. If any suspicion, whatsoever, of a spinal injury do not move the patient. If the patient has had a head injury, back pain, has any numbness or lacks control of limbs, bladder or bowels—suspect a spinal injury. Treatment: Call 911. Make sure to keep the patient from moving. Perform CPR, if needed. If there isn't a pulse make sure to perform chest compressions. Do not remove any items off the patient. If the patient is vomiting or is bleeding from the mouth or nose turn the patient on his/her side only if there are 2 responders—making sure to move the patient in accordance with each responders movement. A cervical collar is not recommended. There is no good evidence of a benefit for cervical collars. Have the patient remain as still as possible until EMS arrives.